Delhi February, 25 - Mr. N. N. Vohra, Governor of Jammu & Kashmir, who is the Chairman of the Shri Amarnathji Shrine Board, chaired the 3-1/2 hour long meeting of the Board which was held here yesterday. The meeting was attended by all the Board Members: Sri Sri Ravi Shankar, Dr. Kapila Vatsyayan, Justice (Retd.) G. D. Sharma, Dr. (Ms.) Sunita Narayan, Shri Vijay Dhar, Pt. Bhajan Sopori and Dr. (Prof.) Ved Kumari Ghai. Besides, Shri R. K. Goyal, Chief Executive Officer and Shri Preet Pal Singh, Additional Chief Executive Officer of the Shrine Board also attended the meeting. The Board directed that the Registration process should commence well ahead of the commencement date of the Yatra. Regarding the date of commencement of the Yatra 2012, the Board held extended deliberations on the recommendations of the Board’s sub-Committee chaired by H. H. Sri Sri Ravi Shankar, which had been set up in July 2011 to advise the Board regarding the duration and schedule of the Shri Amarnath Yatra in 2012 and beyond. This sub-Committee, which was set up by the Board consequent to an agreement reached with BABA Yatri Niyas in June 2011, comprised Swami Avdheshanandji of Haridwar, Swami Gyaanandji of Vrindavan, Shri Y. V. Sharma, President, Chamber of Commerce and Industry, Jammu, Shri R. L. Bharti, formerly Member, J&K Public Service Commission, Shri Prem Gupta, IPS (Retd. ), formerly Inspector General of Police, Jammu, Dr. C.M. Raina, Asstt. Professor, Rashtriya Sanskrit Sansthan, Jammu, and Shri R. K. Goyal, CEO of the Shrine Board as the Member-Secretary. Sri Sri Ravi Shankar briefed the Board about the modalities adopted by his sub-Committee to finalize its recommendations. Regarding the duration and schedule of the Yatra 2012, the Board took note of the fact that whereas in 2011 Shravan Purnima/ Raksha Bandhan fell on 13th August, it falls on 2nd August in 2012. The Board also noted that during the 2010 and 2011 Yatras, despite vigorous efforts to carry out snow clearance operations on the Chandanwari–Sheshnag–MG Top–Panjtarni–Holy Cave axis, this route could become fit for movement only around end June. It was also recalled that during Yatra 2009, despite sustained efforts to clear the snow tracks, the Yatris had faced severe difficulties for the initial 10-12 days, particularly on the Chandanwari route. The Board also noted that the annual schedule of the Yatra in the past 15 years had varied from 15 to 60 days and that about 85% of the pilgrims are in a rush to complete the Yatra within the initial 25-30 days from the commencement of the pilgrimage. Consequent to detailed deliberations, the Board accepted the recommendations of the H.H. Ravi Shankar sub-Committee and directed the CEO of the Board to timely commence the registration of pilgrims and ensure the effective management of the Shri Amarnath Yatra which would commence on 25th June and conclude on Raksha Bandhan on 2nd August. The Shrine Board further decided that the CEO should arrange a Special Pooja on the day of Jyestha Purnima, which falls on 4th June this year. This Pooja shall, if possible, take place at the Holy Cave or at any other suitable location in the Yatra area, to invoke the blessings of Lord Shiva for the safe and smooth conduct of the pilgrimage. 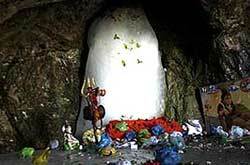 The Board further directed that all possible efforts should be made, in coordination with all concerned agencies, to make a timely assessment to determine whether it would be feasible to consider advancing the Shri Amarnath Yatra by a few days, prior to 25th June. For this purpose, a specific review of the status of the snow melt and the pace of the snow clearing work would be undertaken in the first week of June this year. It was further resolved that if preponement before 25th June is found possible, even by a few days, the CEO shall organize registration of Yatris through a speedy mode like e.g. on-line or even spot-registration. The Board expressed its gratitude to H. H. Sri Sri Ravi Shankarji, and other members of his sub-Committee, for the detailed work done and the comprehensive recommendations presented to the Board, covering varied aspects of the Yatra management. 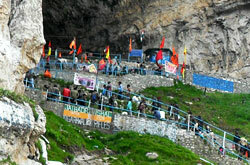 The Board expressed satisfaction about the arrangements made for the conduct of Shri Amarnathji Yatra 2011 and particularly appreciated the measures taken for environmental protection, including the effective operation of two Sewage Treatment Plants (STPs), based on the eco-friendly biological treatment, at the Baltal and Nunwan Base Camps. The Board desired that these measures should be sustained and progressively enlarged and upgraded for the future Yatras. The Board was informed that a Comprehensive Plan had been drawn up in this regard, in consultation with Ms. Sunita Narain, Director, Centre for Science and Environment, Delhi, who is also a distinguished Member of the Board. The Board also approved the proposal for significant augmentation of the toilet facilities at various Camp locations in the Yatra area. Referring to the helicopter services from Pahalgam to Panjtarni, which were started in 2009 on experimental basis for about two weeks before the conclusion of Yatra, the Board noted with satisfaction that the heli services on the Pahalgam-Panjtarni route had been gainfully utilized by over 5000 Yatris every year during the 2010 and 2011 Yatras. The CEO informed that fresh contractual arrangements for the helicopter services from Baltal and Pahalgam to Panjtarni are under finalization and the schedules and rates would be notified shortly. The Board noted with satisfaction that the initiatives taken during 2010 Yatra in regard to the Group Insurance Cover to Yatris, Ponywallahs, Labourers, Dandiwallahs and Ponies are being taken forward for the third consecutive Yatra. In this context, the Chief Executive Officer informed that each Registered Yatri, Labourer, Ponywallah and Dandiwallah is being extended a Group Accident Insurance Cover of Rs. one lakh and necessary arrangements in this regard have since been firmed up. The Board was further informed that, on the directions of the Governor, for Yatra 2012 the amount of Insurance Cover for the ponies had been enhanced from Rs. 25,000/- to Rs. 30,000/-, to benefit the ponywallahs who lose their animals in accidents during the Yatra. The Board was apprised of the efforts being made to progressively upgrade the telecommunication facilities in the Yatra area. In this context, at the request of the Governor, the Union Telecommunications Department had convened a high level meeting few days ago to finalise an Action Plan for providing a further improved mobile connectivity in the entire Yatra area this year. The Board noted that a growingly large number of pilgrims had been losing their lives during the annual Shri Amarnathji pilgrimage, particularly due to cardiac related ailments. It was further noted that 45, 68 and 107 persons had lost their lives in the 2009, 2010 and 2011 Yatras, respectively. Taking note of the loss of precious lives during the annual Yatras, the Shrine Board had decided, in 2010, that every pilgrim seeking Registration for undertaking the Yatra must be fully aware of the serious risk involved in the pilgrimage and must self certify that he/she possessed satisfactory health status to be able to undergo the Yatra. This decision did not yield the envisaged outcome, as the vast majority of the Yatris do not pay heed to the Health Advisories issued by the Shrine Board. In this context, the Board observed that time had come to consider a more effective approach and decided that every person seeking Registration to undertake the Yatra must furnish a Health Certificate issued by a Registered Medical Practitioner (RMP). The Board noted that the enforcement of such a pre-condition had also been advised by the National Disaster Management Authority (NDMA). The Board directed that the C.E.O. should issue a very clear Advisory to inform every intending Yatri to undergo a medical check-up to assess his/her fitness for undertaking the arduous Yatra. The Board desired that the CEO should generate the required awareness through release of appropriate informative features, both in the print and electronic media, for several weeks running before the Yatra begins. In this context, the Board appealed to all sections of the media to provide whole hearted support for enhancing adequate awareness of the arduous nature of the Yatra among the people at large. Shri Amarnathji Yatra-2012 Registration starts from 7th May. 100 Post Offices to also Register Shri Amarnathji Yatra-2012. Shri Amarnath Yatra would commence on 25th June & conclude on 2nd August, 2012. Reduced Helicopter Fare for Shri Amarnathji Yatra-2012.